↑ "Nederlandse Top 40 – week 32 – 1999". Top 40 (in Dutch). Retrieved 2008-03-18. ↑ "charts.org.nz – Macy Gray – Do Something". charts.org.nz. Retrieved 2008-03-18. 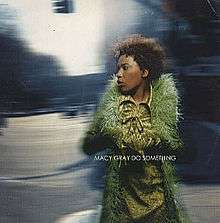 ↑ "Chart Stats – Macy Gray – Do Something". Chart Stats. Archived from the original on 2012-07-22. Retrieved 2008-03-18. 1 2 "On How Life Is - Charts & Awards - Billboard Singles". Allmusic. Retrieved 2008-03-18.